I felt obligated to put my two cents into this overly hyped and commercialized day. As cheesy as this may sound, I truly believe that if you’re with the right one, everyday is like Valentine’s Day. But if you need “a day” to remind you to love and appreciate your other half, well, so be it. A little chocolate, flowers and jewelry never hurt anyone (maybe just some wallets). 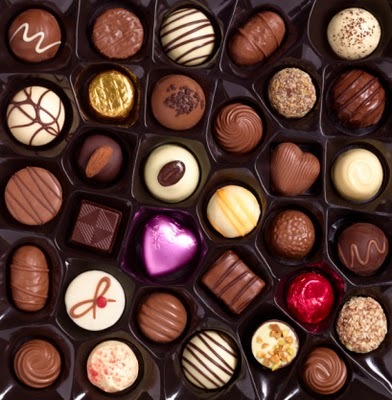 If you still haven’t done anything special for your lady, you might be in trouble, but there’s still time for some chocolate, specially dark ones in my opinion, well… unless she’s allergic, then I strongly recommend staying way! We don’t want a chica version of that Hitch scene. Solo this year you say? No problemo…”life’s like a box of chocolates, you never know who you might meet next!” right?… so go out and splurge on yourself! Why not!? You’re worth it! We are so very lucky and spoiled to have a store at Rockefeller, another reason to love this city even more! It’s pricy, but worth every penny. Rich, smooth melt in your mouth. Pure luxury in a box. Love, love, love. Instead of buying your lady a box, maybe bring her to the store. My favorite store is still the Brooklyn Bridge one (A Rockefeller one is opening). Bundle up and walk the bridge, stroll around the neighborhood and get some hot chocolate. Aside from truffles and bonbons, I always get the chocolate malt balls and dark chocolate corn flakes. Explore, shop and make an afternoon with your special someone even sweeter. And if you plan ahead, you could even get a tour of their little factory and watch as they make these sinfully satisfying treats. Wake your love up early in the morning and have a French breakfast of dark chocolate and pastries, then take home an array of dark chocolate goods. Just like La Maison du Chocolate, these are flown in from France. As you can see, the city of love has my heart and sweet tooth. Have a lovely Valentine’s Day everyone. Whether with that special someone or solo. Life is sweeter with Dark Chocolate. The Jacques Torres in Rock Center is open. I just went and got something nice. Oh yeah, and totally agree on La Maison. Swooon! The three are the most well requested chocolates here in my store. Many really like those. Really? hmm I gotta walk over to Jacques Torres one of these days after work!